You’re finished shopping. You’re ready to head home with your groceries, or that special gift you just bought, or that last item you needed to finish the project you’ve been working on. Sometimes you say, “OK.” Other times you just can’t be bothered, even though you know you might feel guilty afterwards. Either way, by the time you’re back home, you’ve probably forgotten all about it. The rationale behind this fundraising is clear. It’s often easier to say “yes.” The donations may be small, but with enough “yesses” they can really add up. Some retailers raise tens of thousands of dollars from just a few days of “round-up” or spare change checkout donations. The causes are typically good ones, but they were picked by the store, not by you. And your individual role in these businesses’ charitable giving success can seem insignificant – if you remember it at all. Then there’s the guilt factor. Nobody wants to feel guilty, but is guilt really the best way to generate support for even the most worthwhile of causes? Yet, businesses across the U.S. raise as much as half a billion dollars in small donations from their customers each year. That’s money a lot of the beneficiaries might never see otherwise, and it adds up to a great deal of good. What if there was a way to channel the positive power of these kinds of small change donations into real impact for a cause you are passionate about – maybe one that’s not often represented in those in-store charity check-out campaigns? What if you chose the nonprofit, instead of letting the store where you shop do if for you? What if you could make those small round-up donations part of every purchase you make – at the supermarket, at the gas pump, at your local farmstand, online shopping or even bill paying? What if the donations happened automatically, exactly the way you set things up, and you could monitor your giving and your impact throughout the year? Then you’re in luck! 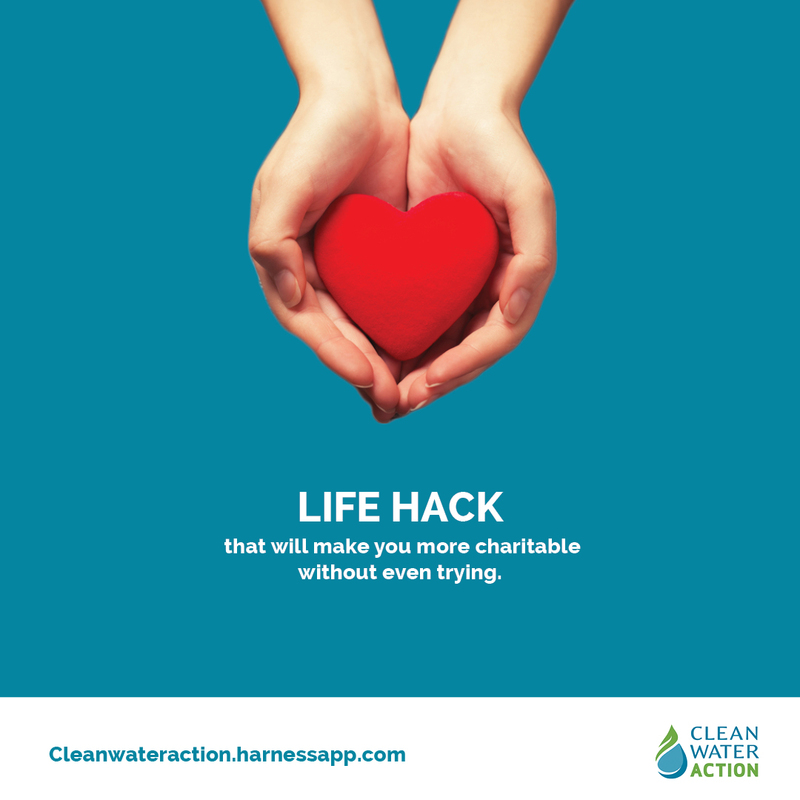 I’ve spent the last several weeks with our team here at Clean Water Action getting ready to launch a new Connected Giving program that does all of this and more. Our new giving platform that puts you in charge and allows you to make small round-up donations with every purchase is now live. I hope you will check it out, and sign up now. All that small change can really add up to make big change – for our water, for our health, for our movement to protect clean water, now and for future generations.